Childhood Obesity and Overweight by Ethnicity/Race in California, 2010′. 38% of 5th, 7,h & 9th graders in California are overweight or obese. 75% of overweight teens are likely to be obese as adults. 80% of children diagnosed with type 2 diabetes are overweight. Ranks #1 among all states in the amount it spends on the health consequences of obesity. 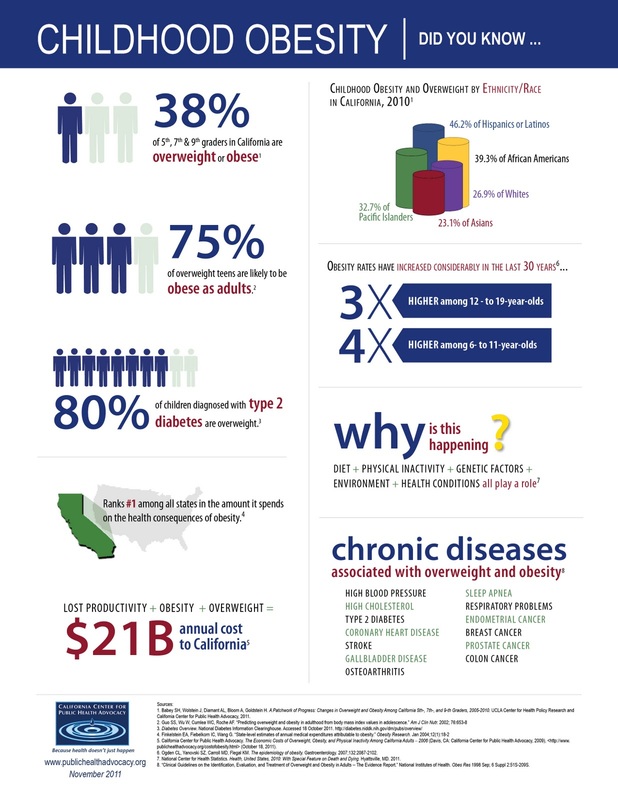 LOST PRODUCTIVITY+OBESITY+OVERWEIGHT=$21 B annual cost to California. 46.2% of Hispanics or Latinos. DIET + PHYSICAL INACTIVITY + GENETIC FACTORS + ENVIRONMENT + HEALTH CONDITIONS all play a role.